olv doesn't sit still when it comes to adopting the cutting edge, we always like to be at the forefront of new ideas, trends, and technology in the ever changing world of website development. So we sent two of our top guys to Canada for a week to do just that. 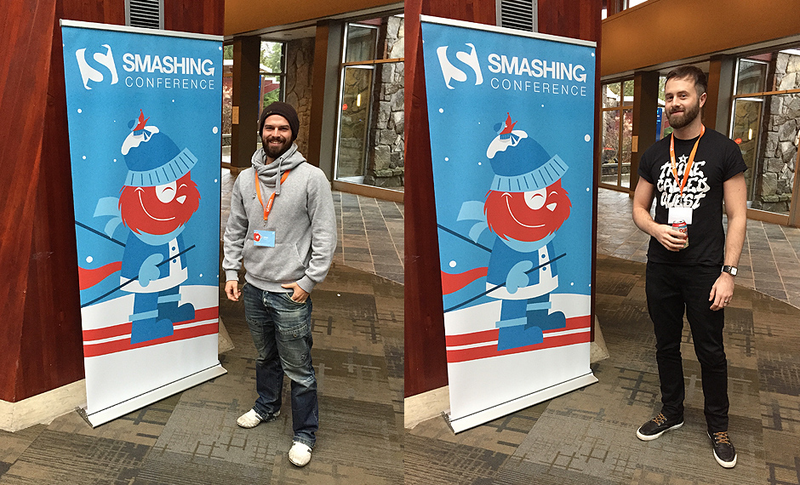 The Smashing Conference combines a practical front-end conference with a spectacular resort and a friendly hands-on community event which took place at the foot of the beautiful Whistler Blackcomb Mountains this year. A long way for two guys from Zolv to head, but worth every mile travelled. With valuable front-end talks and heavily practical workshops, the conference was limited to just 400 available seats, with a mixture of designers, developers and product people in attendance. We sent Ross our Head of Creative and Dean who is key in all our front end development work, to go meet, network and find out more. This conference was a great mix of individuals and nationalities from all over the world, with plenty of networking opportunities with people who are as passionate about web design and development as we are! With key speakers such as Brad Frost (Creator of the Atomic Design Methodology), Patrick Hamann (Lead client-side developer for The Guardian) and Paul Irish (front-end developer advocate Google Chrome), it really was a worthwhile event where the future of Online was discussed and new and exciting ideas were introduced. Watch this space for some key thoughts from our very own Ross & Dean on what they think 2015 is going to hold for the future of website design and development, exciting times ahead!